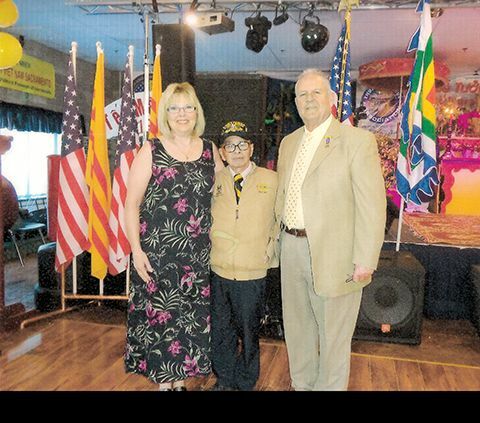 Chris Lambert, right, is with his wife and a South Vietnamese officer at the Hue City battle/massacre annual ceremony in Sacramento. RANCHO CORDOVA, CA (MPG) - The program at the Rancho Cordova Library from 2-3:30 p.m. on Saturday, February 3, is titled Healing for Veterans. But it is meant to help anyone who’s had trauma or extreme grief in their life, and everyone is welcome to come. Admission is free and no registration is necessary. “If you just want to talk, or share, or are ready for a big change in your life, come meet Chris Lambert,” the program brochure states. For 12 years he lost himself in alcohol and drugs. He learned to help others with their problems when he went into recovery, but didn’t address his own combat issues until he retired. “I tucked Vietnam into a little private box after I got sober and I didn’t open that box for anybody,” Lambert said. Now 60 years old, married and retired with grown children, he may volunteer 50 hours a week, and presents his program around the country, all on a volunteer basis. Groups tend to be more effective than one-on-one therapy, Lambert said. His goal is to let people see that they have opportunities for a better quality of life. He likes to keep his program down to an hour and a half. He has a break within that time, with an eight-minute movie in the middle about the combat experience. “If I do a good job we’ll laugh and we’ll cry, and you’ll learn a bunch,” Lambert said.